Firefighters staging in the Mountain Ridge neighborhood during the Indian Gulch Fire. One critical risk factor for homes in the red zone (sometimes called the Wildland Urban Interface) is the amount of fuel in the area immediately surrounding the structure (the “defensible space“). If you’ve got a lot of brush and trees in your yard right next to your house, that can make it really easy for an approaching wildfire to ignite your home. Last year during the Indian Gulch Fire, for instance, some Mountain Ridge folks discovered that a ditch behind their home was filled with woody debris, exactly the sort of fuel that can help a fire jump across the lawns and destroy homes. The risk is even more complicated now because of the way the fire season is no longer limited to the hot, summer months. We’ve seen significant wildfires here on the Front Range in recent years during just about every time of year, and the Indian Gulch Fire took place in March last year, which isn’t really part of the traditional wildfire season. How much progress did we make last year encouraging homeowners to clear our their defensible spaces? Is the city planning to ramp up its efforts again this year to educate and help homeowners who want to reduce the wildfire risk to their homes. This would be good information for the city to include on the website (I searched but didn’t find anything, although they do have some more general tips about fire safety), and it’s a great opportunity for the fire department to reach out directly to the most vulnerable residents and HOAs to help them assess risk and take steps to protect their homes. I know many Council members have been out of town, so it may take them a little while to respond, but I’m looking forward to the answers and I’ll share them here when I get them. Indian Gulch Fire: A very short survey on how you got news and information! Councilor Bill Fisher and I, with help from city staff, put together a short (just nine questions!) survey about the Indian Gulch Fire. We are hoping to learn how folks got news and information during the fire, what sources were most useful, and how the city can improve its communication during an emergency like this. We’d be grateful if you could take a few minutes to fill it out. Take the “Indian Gulch Fire” survey. Golden’s streets crew are the folks that do such a good job of keeping our streets free of snow, keeping them clean, and doing the maintaining and repairing in town. It turns out they also know to protect Golden’s water after a fire. In addition to the many City of Golden firefighters and other city crews focused on the fire itself last week, we also had crews focused on the fire’s longer-term threats to Golden. One critical concern is protecting our water supply, and even during the fire last week we had some of our public works focused on that. Among the strategies: construction of a water quality settling pond in the Indian Creek basin to trap sediment before it gets into Clear Creek. Firefighters putting away the hose line they had established as a contingency defense for the Mountain Ridge neighborhood. Today’s short version: 1,500 acres [Ed. Note: last night’s media advisory mistakenly indicated 1,700], 77% contained, no injuries, no homes lost, life returning to normal in Golden. The big news of the evening: 77% containment on the fire, a very high level of confidence that we’ve got this thing licked, and the evacuation alert for Mountain Ridge is over. There is still some more containment to achieve, some hot spots to hit, and a lot of mop up, but today we clearly transitioned into a wrapping-up mode. What a relief. You may still see some activity but it’ll be much less than we’ve had the past several days. In fact, a lot of the crews that came in to help are on their way home or on to the next major wildlife (including a growing fire near Castle Rock), and the federal Type 1 Incident Management Team that has been running this operation for a couple of days will start transitioning out and leave town by the end of the week. You can watch tonight’s Community Fire Information Meeting online on the city’s web site. The presentations lasted about 25 minutes and then we had another 25 minutes or so of Q & A. We expect Golden Gate Canyon Road to open at midnight tonight and remain open. Clear Creek Canyon will remain closed however, until fire officials and CDOT can either eliminate the danger or rock slides or figure out how best to manage the issue. Stay tuned. Fire bans remain in effect in Golden and unincorporated Jefferson County. Please don’t use any open flames outside and please be careful with cigarettes. Now that the threat posed by the fire is largely gone, officials are ramping up the investigation into the cause. They’ve identified the point of origin (Indian Gulch north of U.S. 6 in Clear Creek Canyon) and there is a very strong belief that the fire was human-caused. If you have any information that might help investigators figure out what happened, please call the tip line: 303-271-5612. Air Resources: 1 Type 1 Helicopter, 1 Type 2 Helicopter, 1 Type 3 Helicopter, 2 Single Engine Air Tankers, 1 Fixed Wing Heavy Tanker. The City of Golden adopted a Wildfire Mitigation Plan in 2007, but a lot of the potential actions described in that plan depend on property owners to proactively clear out a defensible space and take other steps to protect their homes. Over the next few months, we’ll start to look at that plan again, identify any appropriate refinements or updates, and step up education efforts about the things individual homeowners can do. We’ll be happy to work with HOAs or neighborhoods who want to get something going. Our new neighborhood matching grant program may be useful to neighborhoods that want to undertake mitigation or protection efforts. A sign on a lawn in the Mountain Ridge neighborhood. In short, the situation is improving. The fire spread a little today – up to about 1,500 acres – but firefighters seem increasingly confident about controlling it. It remains about 25% contained, but the main threat now is to the north. Because the weather cooperated and because of the resources available, they were able to attack it hard today, including the use of two helicopeters, three fixed-wing aircraft, and nearly 300 firefighters from close to 40 agencies. Unfortunately, the evacuation alert remains in effect for homes that are north of Highway 58 and west of Highway 93, including Mountain Ridge. My sense is that the firefighters don’t think there is a major risk of the fire now doubling back all the way to the Mountain Ridge neighborhood, but they may not end the evacuation alert until the threat is much lower or gone entirely. 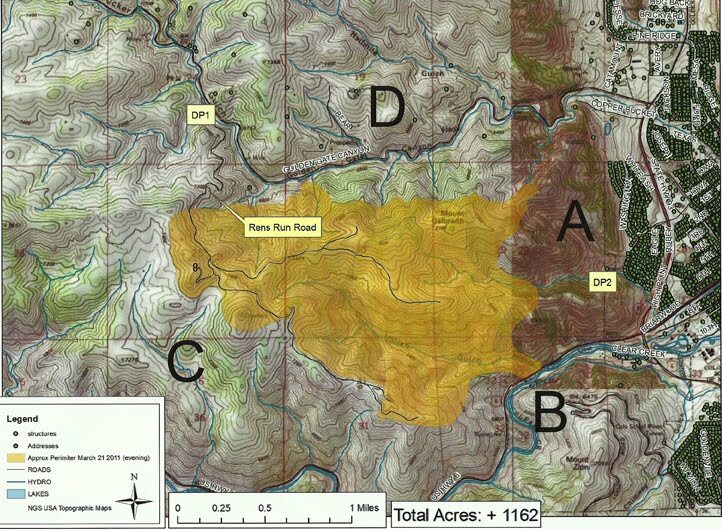 A new Indian Gulch fire map went up today showing the approximate extent of the fire. As with the previous one, please treat it as a general indication of the fire (it may not be very precise, and it may even be inaccurate in places). We’ve scheduled a short community briefing tomorrow (Thursday) evening at Golden City Hall starting at 7pm. You can also watch on Comcast Ch. 8 and online. The briefing will be geared toward Mountain Ridge folks, but of course everyone is welcome. Officials from the federal Incident Management Team and from the city will provide short briefings on various aspects of the fire and the firefighting effort, and then we’ll all be available to take questions. Earlier this afternoon, U.S. 6 closed through Clear Creek Canyon because of the risk of rock slides (especially from the water drops). No word on how long the closure will last. Golden Gate Canyon has been generally closed except to residents, although it’s been somewhat variable depending on the fire and fire crew operations. In addition to our emergency services crews, many other members of the city staff have been helping manage the fire situation and plan for post-fire issues. For example, there is some risk of increased erosion and organic load in Clear Creek upstream from our water intake, and our water folks have been preparing for whatever contingencies may emerge. We’ll report on this tomorrow night, and as we shift from the emergency to the post-emergency we’ll be able to report more on the threats and how we are tackling them. Tonight’s update is shorter than my updates of the last couple of days, and this is a good sign: the threat to Golden posed by the fire is decreasing and there is less to report. It’s not clear that we are out of the woods yet, but the situation is clearly improving. As always, reach out anytime you have questions. The view from Highway 58 to the west looking into Golden at about 1:30pm today. We just scheduled a short community briefing for tomorrow evening at 7pm at City Hall. It will be geared primarily toward Mountain Ridge folks but of course everyone is invited. Representatives from the National Incident Management Team and officials with the City of Golden will update everyone on the status of the fire, firefighting efforts, and evacuation plans. No doubt the fire marshal will be there, and it could be crowded . . . two other options are to watch on Comcast channel 8 (if you live in Golden) and to watch online. Councilor Fisher posted some more info on his blog as well. If you have any questions, you are always welcome to reach out by email, tweets or Twitter direct message, Facebook, phone, pigeon, or Pony Express. I’m having the easiest time keeping up with my email but I will get back to you however you reach out. The news is slowly starting to get better . . .
Today seemed to go well. Although crews contended with high winds for much of the day, the fire apparently didn’t grow so crews were able to attack more aggressively and get about 20% containment. I believe that the extent of the fire remains at about 1,200 acres. The air efforts – which lasted for some hours this morning – presumably helped as well. There is still some risk that the fire will start growing again, but that risk seems to be diminishing and the general mood seems to be one of cautious optimism. That said, we still ended up with a bunch of smoke in the valley this afternoon and evening. I posted a video I shot at about 6pm from just north of town (on Golden Gate Canyon Road) showing smoke pouring off one of the ridges right into Golden, and that was happening (still is, as far as I can tell) along a number of ridges just west of town. Also, in case you are interested, we’ve got a map showing the approximate extent of the fire. Don’t take it too literally but it should give you a sense. The federal Type 1 Incident Team arrived today and takes over tomorrow morning at 6am. This team brings the highest level of emergency management skills and a bunch of resources, so that should help. The National Weather Service expects heavy winds until later tonight but lighter winds (10-20 mph) through tomorrow, which should help a lot also. Our crews have been working hard in Mountain Ridge to make sure it is as protected as possible just in case the fire does double back. They cleaned out brush, laid fire line, and took other steps to prepare for what they call “structure defense” (i.e., protect homes). They will patrol and fight embers and anything else that might come over the ridge. They are using a set of “triggers” based on wind speed, fire location, and other factors to determine if an evacuation is necessary. If it is, residents will get a reverse 911 call and of course we’ll do everything else necessary to alert everyone. If this happens, fire crews may conduct back burns to actually burn out the grass and other remaining fuel just west of those homes to make it tougher for the fire to spread. At this point, I believe everyone living north of Highway 58 and west of Highway 93 is in an evacuation alert zone (aside from those folks up Golden Gate Canyon who actually were evacuated). If an evacuation order is issued, folks will need to evacuate quickly, so – if you are in the alert zone – please remain ready to leave quickly with your medicine, valuables, pets, and the like. The Red Cross has some useful info about preparing for emergencies and evacuations. The simple answer is that right now I don’t think there are any. It’s just what you’d expect of Goldenites – a bunch of people offering to volunteer and help before any call goes out – but at this point everything is under control. The bigger issue is actually the opposite: keeping folks out of the way of the firefighters and other emergency crews. So thank you to everyone that’s offered but for now we seem to be all squared away. Similarly, thanks to everyone offering to provide supplies to the firefighters but that’s under control as well, and on this we’ve got the same concern as well: keeping folks out of the way of the crews so they can do their work. Fire bans are in effect in Golden and unincorporated Jefferson County. You can download the official news release if you’d like but the punch line is simple: please don’t use any open flames outside. Quite a few folks have asked about health concerns related to the smoke. The simple answer is that the smoke isn’t healthy, so I encourage you to take whatever steps you can take to limit your exposure. Some suggestions: keep your windows closed and exercise indoors. Jeffco Public Health has a helpful “Health Threat From Wildfire” fact sheet if you want more information. Mountain Ridge resident Jeff Warner has been taking some amazing photos. You can either view his blog or ‘like’ his Facebook page to see them. In yesterday’s newsletter I asked you to let me know about any other good information sources, and I learned about the Jefferson County Sheriff’s Department blog (thanks Sheila!). 1) Reverse 911. If you have a landline and are in one of the areas that has been put on preliminary evacuation alert or has actually been evacuated, you should have received one or more reverse 911 calls. This seems to be working well. However, if you don’t have a landline, you need to register your cell phone or VOIP # on the system. The problem is that it can take a week for your info to get updated, so if you are a new subscriber you can’t rely on this in the short term. 2) Local television news. Our city staff is worked super hard to get the local news stations good, timely info, although sometimes it does get lost in translation. 3) Jefferson County’s news release web page. They aren’t super frequent, but I’ve found the info they post to be very useful. 4) My Facebook page. I use my “Mayor of Golden” Facebook page a lot and I’m posting relevant information as I get it. There may be other good Facebook page information sources as well. 5) Twitter. You’ll find a huge amount of information and conversation if you set up a search on the #goldenfire hashtag (i.e., set up a search for “#goldenfire”). It’s real-time, which is very helpful, but if you follow that search term the sheer volume now can makes it tough plus the source of any given piece of info isn’t always clear. An alternative is to track tweets by specific sources you trust. Some options include the City of Golden (@CityofGolden), mine (@jacobzsmith), and Councilor Fisher’s (@GoldenBilFish). A bunch of news outlets and reporters have feeds as well. Just a few examples: @MistyMontano, @KUSADESK, @DomGarciaCBS4, and @meganverlee. Either way you’ll find a lot of information there, and much of it seems to be accurate. If you aren’t using Twitter yet, you might find it useful now.